Pack a Pak--the perfect grab-and-go for your active lifestyle. Ideal for your lunch box, next sporting event or picnic! Crunch Pak--your delicious, no hassle, perfect treat. 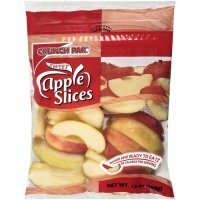 14 ounces of sweet apples, sliced and ready to eat in a re-closable package. Perfect for the family on the go! Fresh Apples, Calcium Ascorbate (A Blend Of Calcium And Vitamin C To Maintain Freshness And Color). Fuji apples are typically large or very large and round, on average the size of a baseball. They contain between 9-11% sugars by weight and have a dense flesh that is sweeter and crispier than many other apple varieties, making them popular with consumers around the world. Fuji apples also have a very long shelf life compared to other apples, even without refrigeration. 3-Pound (min) bag. Crisp. Sweet. U.S. fancy. From Apple Country. As a handy snack or tucked away in a bagged lunch, apples' natural sweetness appeals to people of all ages. So strive for 5 servings of fruits and vegetables per day! Sensible Solution: 40% less saturated fat than butter. 6 g total fat & 20 mg cholesterol per serving. This product has 3.5 g saturated fat per serving. Butter has 7 g saturated fat per serving. May be used in small appliances (in appliances that require the use of distilled water). Prepared by steam distillation. Diet Pepsi.0 Calories Per Bottle. Quaker Chewy Granola Bars Peanut Butter Chocolate Chip- 8 CT.Est 1877.100 calories per bar.Made with 100% whole grains & other delicious ingredients.Flavor with other natural flavors.Real chocolate chips.Per bar:100 calories.1g sat fat, 6% DV.90mg sodium, 4% DV.7g sugars.8-0.84 oz (24g) bars. Multi Grain Cheerios Gluten Free Cereal contains 18 grams of whole grain per serving. At least 48 grams are recommended daily. A whole grain food is made by using all three parts of the grain. All General Mills Big G cereals contain more whole grain than any other single ingredient. The taste you love has always come with oats that are naturally gluten free. We're simply sure they stay that way. When Phil, a member of the Cheerios team for over 50 years, found out his daughter-in-law couldn't eat gluten, he knew his team had to find a way to make sure every family could share breakfast together. We know there are lots of families out there who don't want to let dietary restrictions get in the way of spending time together. Now that Cheerios are gluten free, more families than ever can sit down to share breakfast, and we couldn't be happier. After all, bringing families together around the breakfast table is exactly why we're here. Vitamins A and D added. Pasteurized. USDA Organic. Produced without the use of antibiotics, added growth hormones or dangerous pesticides. Excellent source of calcium. A choice you can feel good about. Horizon Organic products are as good for you as they are delicious because they are produced without the use of antibiotics, added growth hormones or dangerous pesticides. That's why choosing Horizon Organic is a wholesome and nutritious way to help reduce your exposure to added chemicals. And drinking our milk is also a great way to nourish your body. It provides an excellent source of calcium and vitamin D.
Ruffles Brand Original Potato Chips Party Size!Ruffles Have RRRidges! Spreadable right from the fridge. Genuine Wisconsin Spreadable cheese. A good source of protein. Thomas' Hearty Grains 100% whole wheat bagels, each with a full 10 grams of protein, are a good source of the protein your body needs to stay healthy and strong. 100% whole grain. 48 g or more per serving. Eat 48 g or more of whole grains daily. Kellogg's Froot Loops Cereal.Sweetened multi-grain cereal. Whole grain.13g or more per serving.Eat 48g or more of whole grains daily.wholegrainscouncil.org.Natural fruit flavors.160 calories per pack.Good source of fiber & made with whole grain. Made with unbleached flour and has a buttery taste. Famous Dutch taste. Delicious to serve at the nicest dinners. Why are Martin's Famous Dutch Taste Potato Rolls and Bread so Good? Because we use the highest protein wheat flour available, nonfat milk, potatoes, real cane sugar, cream yeast, vegetable oil and butter. Over the last forty years Martin's Famous Potato Rolls have become the preferred choice in the Northeast. Coppertone Sport AccuSpray Sunscreen Broad Spectrum SPF 30.High performance. Sunscreen.UVA/UVB.Stays on strong when you sweat (won't run into eyes and sting).Plus antioxidant defense.Water resistant (80 minutes). Made with turkey and chicken & pork. No artificial flavors, colors, fillers or by-products. 10 servings. Fully cooked. Heat and eat! Inspected for wholesomeness by US Department of Agriculture. Easy Pancake Directions: 7-8 4-Inch Pancakes: 1 cup mix, 3/4 cup water; 14-15 4-Inch Pancakes: 2 cups mix, 1-1/2 cups water; 21-23 4-Inch Pancakes: 3 cups mix, 2-1/4 cups water. Important: Water level may be varied depending on desired thickness of pancakes. 1. Blend mix and cold water together with a wire whip. Batter will be slightly lumpy. (Do not overmix). 2. Pour slightly less than 1/4 cup batter per pancake onto lightly greased and preheated 375 degrees F griddle (Medium heat). 3. Cook pancakes 1 to 1-1/4 minutes per side, or until golden brown, turning only once. Easy Waffle Directions: Makes 12, 4-inch waffles. 1. Blend 2 cups mix, 1-1/2 cups cold water and 2 tablespoons oil together. Batter will be slightly lumpy. (Do not overmix). 2. Pour batter onto lightly greased and preheated waffle iron. 3. Cook waffles until steaming stops, about 5 minutes, or until golden brown. Green Giant Kitchen Sliced Green Beans.Picked at the peak of Perfection.1/2 inch diagonal cut. Kellogg's Corn Pops Crispy Glazed Crunchy Sweet Cereal.Good source of fiber. Sensible Portions Cheddar Cheese Garden Veggie Chips.New.Made with potatoes, tomatoes, carrots & beets.Potato crisps.Gluten free. Pepsi Soda. It has very low sodium. Contains caffeine content.Same great Pepsi taste. Retro design. Naturally and artificially flavored. 10% daily value calcium. Good source of calcium. 0 grams trans fat per serving. No preservatives. Made with real nonfat milk. Definitely a wonderful service and we would not hesitate to use it again.